I hope you can help me with a really weird issue I'm having with one of our laptops. Migrating from Exchange 2003 to Exchange 2010. 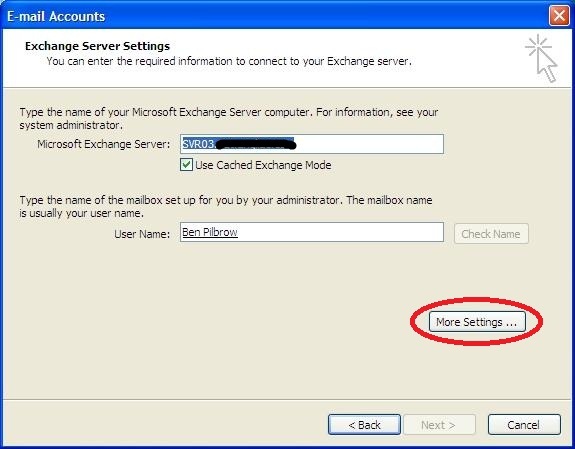 Earlier today I moved a users mailbox from Exchange 2003 to Exchange 2010, and ever since they have been unable to receive new emails into Outlook and the status (in the bottom right corner) says Disconnected. I have got her working on OWA on the new server, so her mailbox looks to be intact and not corrupted. 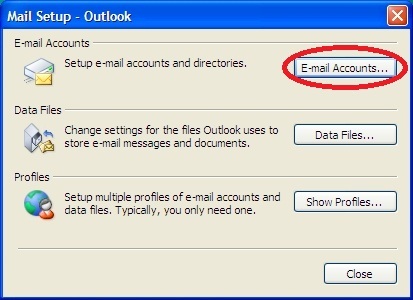 I've also done a test and it's OK on another Outlook 2010 laptop, so all signs seem to be pointing to Outlook 2003. The laptop is due for replacement later in the year (with new Office 2010), and I guess I can expedite that if necessary. Go to Tools->Email accounts. Go to More Settings for her account, then click the security tab. 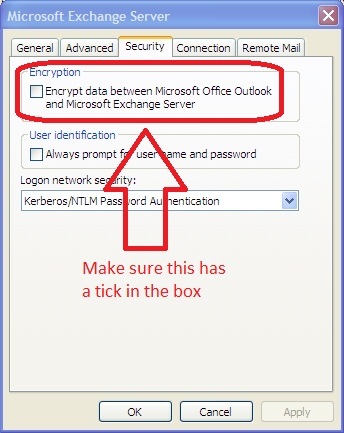 Make sure the "Encrypt data between Microsoft Outlook and Microsoft Exchange" is checked. It could be that you haven't enabled the encryption between Outlook 2003 and your Exchange Server. I just so happen to have some pre-baked instructions for our users for this kind of thing! There's also this Microsoft KB article if you fancy excruciating detail. Open the Control Panel and load the Mail applet. On the Security tab, make sure the Encrypt data between Microsoft Office Outlook and Microsoft Exchange Server option is checked. OK out of all the screens and load up Outlook. It should think about it for a second, connect and download the new items. Not that I'd particularly recommend it, but you can also remove the requirement of encryption on the Exchange Server if you so desire (note it's just the requirement of encryption, it doesn't disable encryption of Outlook tries to use it). You can run the cmdlet Set-RpcClientAccess –Server <<Server Name>> –EncryptionRequired $False on all CAS Servers and all Mailbox Servers housing Public Folder Databases. Not the answer you're looking for? Browse other questions tagged exchange exchange-2003 exchange-2010 outlook-2003 exchange-migration or ask your own question. Exchange 2003 to 2010 Transition - How to tell if Public Folders are in use and can be deleted? 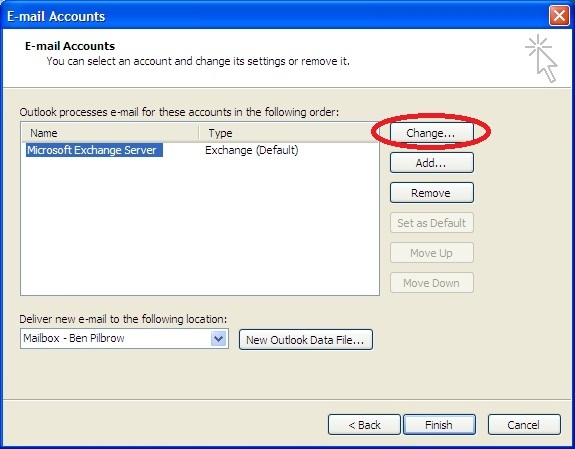 How to access an Exchange 2010 mailbox from Outlook 2010 not in the domain? 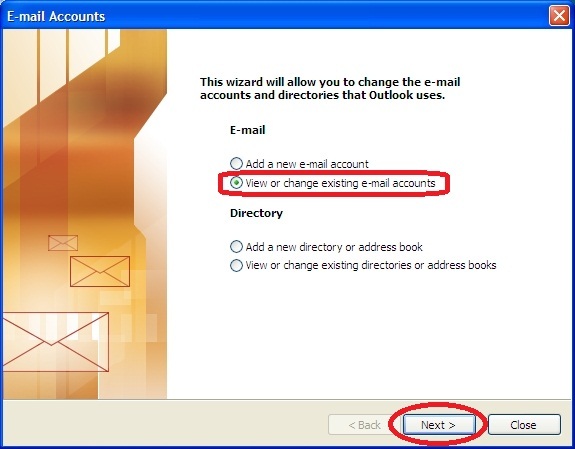 What could prevent autocompletion from working on Exchange 2010/Outlook 2010?